"Mary Poppins Returns" will star Emily Blunt as Poppins. Disney is bringing back Mary Poppins and the new cast is Supercalifragilis--well, you get the idea. 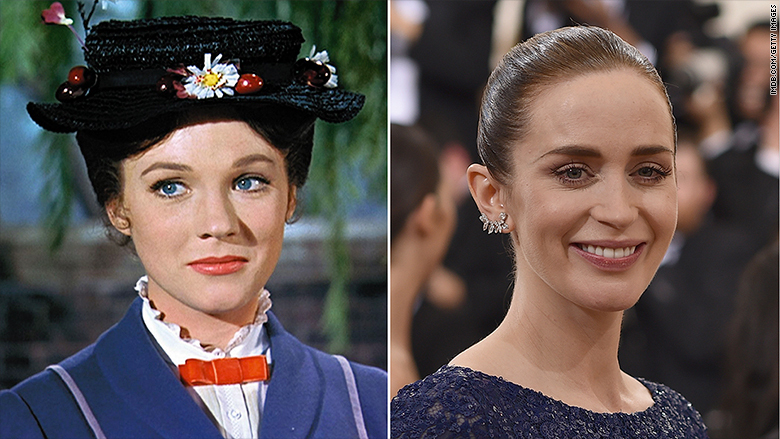 "Mary Poppins Returns," a sequel to the 1964 musical, will star Emily Blunt as the magical umbrella wielding nanny. It will also star Lin-Manuel Miranda, the creator and star of the Broadway smash "Hamilton," as a new character, a street lamplighter named Jack, according to the studio. It will fly into theaters on Christmas Day 2018. The film will take place in Depression-era London and will follow a grown up version of the children from the original as Poppins uses her magical touch to help the family "rediscover the joy and wonder missing in their lives," the studio said. Disney (DIS) also said the film will draw inspiration from the "wealth of material in P.L. Travers' seven additional novels" about Poppins. The film will be directed by Rob Marshall, who has directed Blunt in Disney's "Into the Woods." "The iconic original film means so much to me personally, and I look forward to creating an original movie musical that can bring Mary Poppins... to a whole new generation," Marshall said in a statement. The casting of Miranda is quite notable seeing the Broadway star has had an incredible year, winning a Grammy and the Pulitzer Prize for "Hamilton," which has become a sold-out phenomenon on Broadway. "Mary Poppins" has had a rich history at the Walt Disney Studios. The 1964 film, which was produced by Walt Disney himself, made $670.8 million when accounting for inflation and won Julie Andrews, who originally portrayed Poppins, an Academy Award for Best Actress. Its soundtrack of songs like "A Spoonful of Sugar" and "Supercalifragilisticexpialidocious" have also gone on to become ingrained in popular culture.